Status: Rare casual spring and summer visitor statewide. Rare casual breeder east. Rare casual fall migrant statewide. Documentation: Specimen: HMM 2496, Inland, Clay Co 5 Jun 1916 (Swenk, Notes After 1925). Taxonomy: After the taxonomic revision of Rallus rails (Chesser et al 2014), King Rail as reconstituted contains two subspecies, elegans of eastern Canada and the northeastern United States, and ramsdeni of Cuba and the Isle of Pines. Over half of the approximately 50 King Rail records for the state are in the period 26 Apr-15 Jun. Arrival is in late Apr, although there are earlier reports 10 Mar 1990 Sheridan Co (Grzybowski 1990), and 2 Apr 1967 Adams Co, possibly wintering birds. Northern, and particularly inland, breeding populations are generally migratory (Pickens and Meanley 2015). There is a specimen, UNSM ZM6095, 8 May 1920 Lincoln, Lancaster Co.
Summer: There are no recent breeding records, although there are several reports which indicate that breeding does occur on occasion, although only about six have occurred since the 1930s. Ducey (1988) cited early records from Douglas and Lancaster Cos around 1900, and Swenk (Notes Before 1925) noted that it possibly nested at Inland, Clay Co in 1915 and 1916, although it was unclear whether the nest was of King Rail or Virginia Rail. A juvenile collected at Inland 1 Oct 1916 (HMM 7458; Swenk, Notes Before 1925) may have hatched there, but could also have arrived from elsewhere. A sighting of four near Carter Lake, Omaha 28 Jun 1930 is suggestive of breeding (Swenk 1930). An adult with 5-6 young was seen near Fairbury, Jefferson Co 29 Jul 1940 (Callaway and Callaway 1940). Sightings at a marsh in Lancaster Co 20 May-11 Sep 1971 were suggestive of breeding (Cink 1971). The presence of up to five at Capitol Beach Lake, Lancaster Co 24 Jul-18 Aug 1984 (Grenon 1990, Williams 1985a, 1985b) indicated successful breeding. Summer reports without evidence of breeding include a male specimen, HMM 2496, cited above (Swenk (Notes After 1925), one calling at East Sweetwater Lake, Valentine NWR, Cherry Co 20 Jun 2006, a specimen, HMM 2496B, collected 5 Aug 1923 at Kearney, Buffalo Co (Bray et al 1986), two seen 5 Aug 1966 at Plattsmouth, Cass Co (Heineman 1967), one in eastern Otoe Co 5-16 Aug 1997 (Brogie 1998), two adults photographed at LaPlatte Bottoms, Sarpy Co 24 Jul 2010 (Brogie 2011), one heard in Nance Co 7 Aug 2016, and one which responded to a tape at Facus Springs, Morrill Co 4 Sep 1992. 15 Dec 2006 identified by call near Brady, Lincoln Co. The latter three reports, along with two early spring records (see Spring), raise the possibility of overwintering, suggested by Rosche (1994) for Clear Creek WMA. King Rails, like Virginia Rails, occasionally remain in northern parts of the breeding range if spring seeps or open water are available and the temperature rarely drops below -1C in Jan (Root 1988). 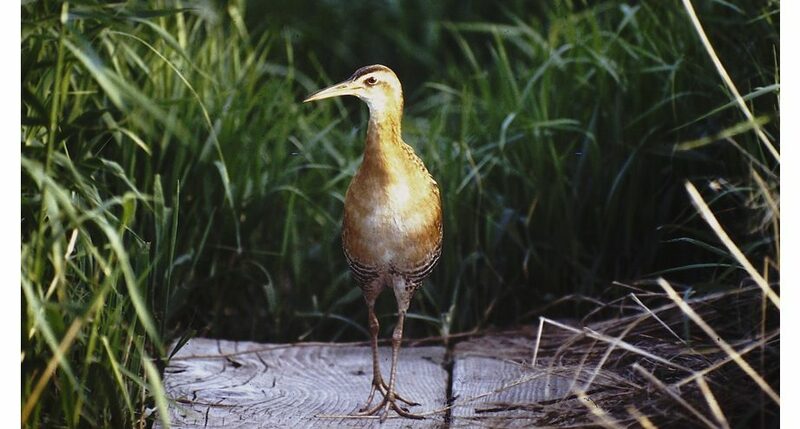 Photograph (top) of a King Rail at North Lake Basin WMA, Seward Co 4 Jun 1996 by John Sullivan. Bent, A.C. 1926. Life histories of North American marsh birds. Bulletin of the United States National Museum 135. Dover Publications Reprint 1963, New York, New York, USA. Callaway, S., and A. Callaway. 1940. Some unusual mid-summer birds noted in the Fairbury, Jefferson County vicinity. NBR 8: 94-95. Cortelyou, R.G. 1985. 1984 (Twenty-seventh) Fall Occurrence Report. NBR 53: 5-18. Heineman, P.T. 1967. King Rail. NBR 35: 23. Root, T. 1988. Atlas of wintering North American birds, an analysis of Christmas Bird Count data. University of Chicago Press, Chicago, Illinois, USA. Swenk, M.H. 1930. Letters of Information 50: 3. Williams, F. 1985a. Southern Great Plains Region. American Birds 39: 72-75. Williams, F. 1985b. Southern Great Plains Region. American Birds 39: 931-933.